With the album finished and initial talks begun with BestBuy in late 2007, the decade-old dirty laundry with the record company turned into another stop-gap. In early spring, a heavy-weight tiebreaker was brought in to orchestrate the final details surrounding the release. Azoff, the legendary Eagles manager, had been linked to GNR back in 2006, but a deal came never came to pass at the time. Even the publishing right controversy was resolved amicably, through a financial settlement. Back in January 2001, the shows were opened with an animated short film, in which Axl enjoyed a Diet Coke. Seven years later, he was about to trade off. On 04/05/08, NIN.com published a recent picture of Robin Finck at the studio, with the caption, 'Welcome Back!'. He'd arrived just in time to begin recording parts for Reznor's new studio album, The Slip, which was released in the following month as a free download. “[The initial] conversation [with Trent Reznor] happened [in around March 2008],” Finck says. ... Actually it started in an email and then a telephone conversation and eventually we had an organic conversation about what was going to happen - he shared with me the plans he had with NIN and asked if I would like to be a part of it, and I agreed to join the band again. Robin leaving Guns may have happened as early as late 2007, given what DJ Ashba has mentioned regarding his audition. Ashba's audition was held by or on March 2009, which suggests the auditions would've been ongoing when Robin and Trent reconnected. As was the case in 1999, Robin left the band after completing work on several albums. Del James was the first from the GNR camp to comment on the matter. Incidentally, Josh Freese, who played with Robin in GNR in '98-99 and toured with him in '00 (while Robin was in NIN and Freese in their opening act, A Perfect Circle), played the drums on the album and also joined NIN for the 2008 tour. In the fall, Reznor confirmed that Freese was to leave the live band following the December shows. This fueled speculation that Robin would do the same, making himself available for GNR in the process. In March 2012, over four years after leaving the band, Robin was reunited with GNR onstage. "A major music-oriented television channel has pitched an idea for a reality series to Axl Rose, according to sources close to the project. The show, which would appear on a cable channel that asked not to be identified, would follow the troubled rocker as his continues his decade-long effort to release the Guns N' Roses project "Chinese Democracy." Del James was quick to jump on the matter, delivering an unsurprising response. The network might've just as well consulted the unofficial GNR spokesperson. While touring was apparently grounded while waiting on Robin to fulfill his NIN commitments, GNR apparently looked into working their way around it. NIN would, in fact, go on a break after their last North American show on 12/13/08. As for GNR, a return to China might've been in the cards. On July 6th, a song listing for the upcoming video game Rock Band 2 was unveiled at Kotaku.com. Among others, it featured an unreleased GNR track called Shackler's Revenge. A faux promotional image for Shackler's Revenge. A week after the song listing came out, the matter was confirmed by the band. A few days from the Shackler's Revenge announcement, versions of nine songs from the album were leaked. 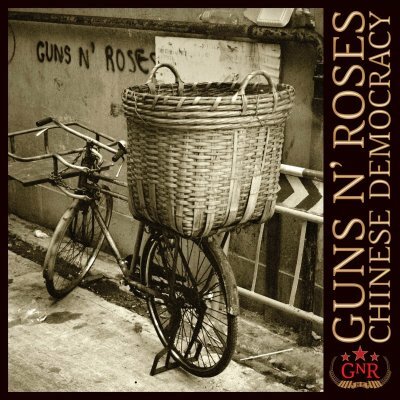 "Nine purported 'mastered, finished' tracks from Guns N' Roses' 14-years-in-the-making album 'Chinese Democracy' were leaked online yesterday (June 18) by the Web site Antiquiet.com, prompting a quick cease-and-desist from the band's handlers and the removal of the links. The unknown track was later revealed to be Prostitute, a song worked on since 1993. The leaks were outstaged only by the showmanship with which the leaker was brought in. Apparently, media attention was guaranteed on the get-go. Shackler's Revenge was leaked roughly a month after the 'Antiquet Nine'. The leaks, as well as the well-publicized arrest, coincided with an apparently critical period in the album release negotiations. Apparently, Azoff had requested a competing offer from Wal-Mart, a retail chain with which he'd made a 1-year exclusive distribution deal for The Eagles' comeback album Long Road out of Eden in 2007. All this a few days following the arrest of Kevin Skewrl. On September 14th, Rock Band 2 was released. The accompanying GNR track, Shackler's Revenge, was the first piece of officially released new music from the band since Oh My God. OMG was premiered at the Video Music Awards event on 09/09/99, nearly nine years prior to date to the Rock Band 2 release. "[Shackler's Revenge on Rock Band 2] is the beginning of what is expected to be a series of announcements about Guns N' Roses, the main point being that the album will be finally released and before Christmas. First of the announcements was the big one. And so, Irving Azoff succeeded in covering both major US sales for Chinese Democracy, as well as Axl's monumental studio bill - both Axl and Geffen were now set to profit. As If The World premiered over the closing credits of Body of Lies, the final release date was announced. 20 months after the previously announced tentative release date, the album was finally set to come out. The mythical bicycle album art, previewed by Axl in 2002. The third cover may possibly be the 'Sorry' automatic rifle, another visual design mentioned by Axl. The additional covers never reached wholesale. Axl himself commented the matter later on. As the Best Buy deal was signed, the final mixes were taken to Gateway Mastering in Portland, Maine, where they were put into the established hands of audio engineer Bob Ludwig. "In October, when I first heard some of final mixes which were incredibly multi-layered and dense, I was surprised by two things: The mixes were so finally honed that doing the smallest move sounded like I had done a lot and also that adding the typical amount of compression used in mastering these days took the life and musicality out of the recordings in a big way. The trial disc I submitted to the producers had 3 versions: The one I personally liked had no compression that was used just for loudness, only compression that was needed for great sounding rock and roll. Then, knowing how competitive everything is these days, I made two more masterings, one with more compression and another with yet more compression, but even the loudest one wasn’t remotely as loud as some recent CDs. As the release date crept closer, the amount of stateside promotion was put into question. All n' all, pre-release promotion was scant, aside some thirty-second advertising clips, consisting of text, album artwork and a brief sound clip from one of the songs. Stateside listening parties were held in nine cities, in between November 17th and 20th. On November 23rd, the album was featured as the official soundtrack of the 2008 Grey Cup, the Canadian equivalent to SuperBowl. The album debuted at number 3 at the Billboard 200 chart on December 2nd, having sold 261,000 copies on the first week of release. It did, however, top the global sales with a result of 640,000 copies. Axl had vanished on the eve of his victory. As Chinese Democracy did come out, Dr Pepper was to make good of their promise. "According to WalletPop.com, Dr Pepper's web site appears to be having a hard time keeping up with demand for a soda following the soft drink manufacturer's announcement earlier in the year that it would give a free drink to everyone if GUNS N' ROSES' long-awaited new album, "Chinese Democracy", album actually dropped in 2008. Interested fans are being asked to visit DrPepper.com today (November 23), the day "Chinese Democracy" is released in the U.S. exclusively via Best Buy. After registering online, fans will receive a coupon redeemable for a 20-oz. Dr Pepper wherever the drink is sold. The twist: the coupon is only available for 24 hours and will expire on February 28. Repeated attempts by WalletPop.com staff to reach DrPepper.com have resulted mainly in a longtime "loading" message on the main page. When WalletPop.com has managed to get in, the coupon location wasn't immediately clear. It's apparently behind "Promotions" and then "Free Dr Pepper" — but then that page wasn't loading for WalletPop.com either. The band were quick to jump on the bandwagon. "Guns N' Roses' and Axl Rose's lawyer has castigated Dr Pepper, accusing the soda maker of failing to deliver on its "Chinese Democracy" (Black Frog/Geffen) free soda promotion, which the band was never involved in. In a long series of good intentions gone bad during the making of the album, the closing note would be a legal battle with a soft drink company. Who would've guessed? Following the album release, tour rumors picked up again. Perhaps the most burning question was the would-be lineup. Everything looked good for a quick start in 2009, after Robin'd return from the road with NIN. In December, though, it appeared the tour had been postponed. A possible reason might've been Robin's commitment to an Oceanic tour with NIN in February. As these offhand comments were picked up by Rolling Stone and given an added emphasis, Fortus was no doubt asked to correct himself. An apparent snippet of a rough-cut live video for the albums second single, Better. As with the Black Sheep / Harley-Davidson promo, Better was again considered a prime canditate for a visual representation. Axl even went on to mention the video would feature footage from the recent live performances. A release date was also thrown into the air - will he ever learn? While the video never came, some dubious accusations did surface - this time, they were even more ridiculous than the case of the mistaken Harley promo. Ulrich later commented the Better issue in a backstage fan interview. "I have heard about this, yes. There's a couple of clips of me in the video and they asked if I'd sign off on it. When it got to me, I signed off on the one clip and that was something that happened. I don't know where it came from. Someone else asked me about it the other day... I'd love to be in a Guns N' Roses video. By December 17th, Chinese Democracy had sold 1,156,000 copies worldwide, with BestBuy sporting a stateside result of 365,000. As they'd bought 1,6 million copies on behalf of their exclusive, the actual amount of sold copies was, by then, a little short of 2,3 million. Rather fittingly, the album therefore has two separate sales results. On November 18th, Tom Zutaut, the A&R Man who originally signed Guns to Geffen Records and worked on the bands all releases up to the Sympathy for the Devil single in late 1994, and almost got Chinese Democracy made during his year with Axl in 2001, was escorted out of the albums listening party at The Roxy in Hollywood, California. As Zutaut stood on the sidewalk, French horns kicked in and Madagascar played out. On some level, he must've appreciated the irony of it all. Between December 12th-14th, Axl made a series of appearances at the three major Guns N' Roses message boards, delivering answers to various matters in a rather open and verbose fashion. The reputed Howard Hughes of Rock had released his album and finally made the distance towards those who'd stayed up and waiting. In mid-December, Classic Rock published an abridged version of Chinese Whispers as a 20-page supplemental booklet for their January 2009 issue. The chronicle which had started as a collection of quotes, mostly from printed sources, had succesfully made the transition to the original medium, becoming a Chinese Democracy article by its own right. In January, a new journey begins.